QUICK STUDY: Tanveer Sheikh works in Dr. Jennifer Chan’s lab at the University of Calgary. 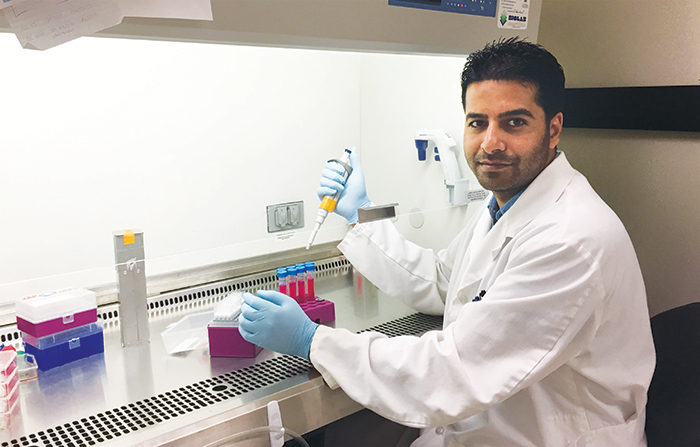 It’s the promise of a cure that drew Tanveer Sheikh into a “dream team” of scientists at the University of Calgary. The young postdoctoral fellow, who has earned a bachelor’s, master’s and PhD degree, joined Dr. Jennifer Chan’s lab in June of 2013, where he now studies aggressive cancers like glioblastoma. “In the long term, I would like to have my own lab working in the same field of cancer research,” says Tanveer Sheikh. 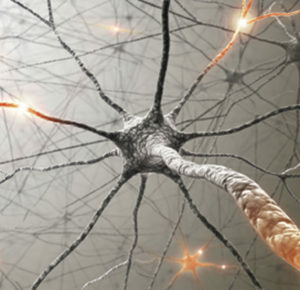 Glioblastomas are aggressive tumours normally found in the brain or spinal cord. They are quick to spread, and Chan’s dream team project (funded by a host of organizations including the Terry Fox Research Institute and the Alberta Cancer Foundation) is committed to studying them and other forms of cancer. Over three decades, glioblastoma treatment has changed very little, but Chan’s team is out to fix that. 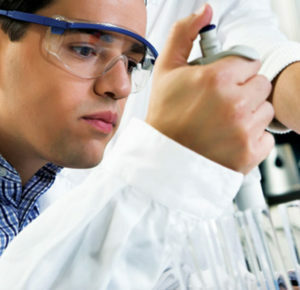 Their work is focused on developing promising new drugs, and they project that the first of the new drugs discovered through their research will be ready for clinical trials in two to four years. The lab’s research has received $8.2 million in funding and is staffed by some of the best minds in cancer research, including Sheikh. Sheikh’s work focuses specifically on CIC, a specific gene mutated in almost all oligodendroglioma patients. Oligodendroglioma is a class of less-aggressive brain tumours that affect patients in early adulthood. It mutates in various ways as it progresses to higher grades, but ultimately surfaces as glioblastoma. The CIC mutation in these patients was recently identified in Chan’s lab as a hallmark of this disease, thus pointing to a need for glioma research. “Unlike some tumours, even when gliomas are detected early it is virtually impossible to remove them with surgery. We have to understand the biology of the disease so we can find particular vulnerabilities of the cells that we might be able to target with other means, like chemotherapy,” says Chan. It’s a challenge, but one that Sheikh has embraced. Working with Chan has left him with new knowledge and admiration for her commitment. “Dr. Chan has immense talent in terms of her critical thinking, generating ideas and successful collaborations. I got to learn a lot from her mentoring,” he says. He adds that, while working with her, he had the opportunity to study brain tumours in the neurodevelopment context and was able to share ideas amongst his peers in other labs. Chan says it is Sheikh’s meticulous work ethic and quiet attitude that make him good at his work. “He’s been excited to learn new techniques in my lab,” she adds. She notes that the studentships and fellowships funded by the Alberta Cancer Foundation are invaluable in the effort to support trainees like Sheikh in Alberta. Sheikh first joined the lab through Chan’s funding, but has since received his own fellowships. “Every person they fund is like a seed they throw out there, and if science is for them, that seed becomes a future researcher that is going to join the army and fight the battle,” Chan says. And Sheikh’s aspirations don’t stop in Chan’s lab. “In the long term, I would like to have my own lab working in the same field of cancer research,” he says.